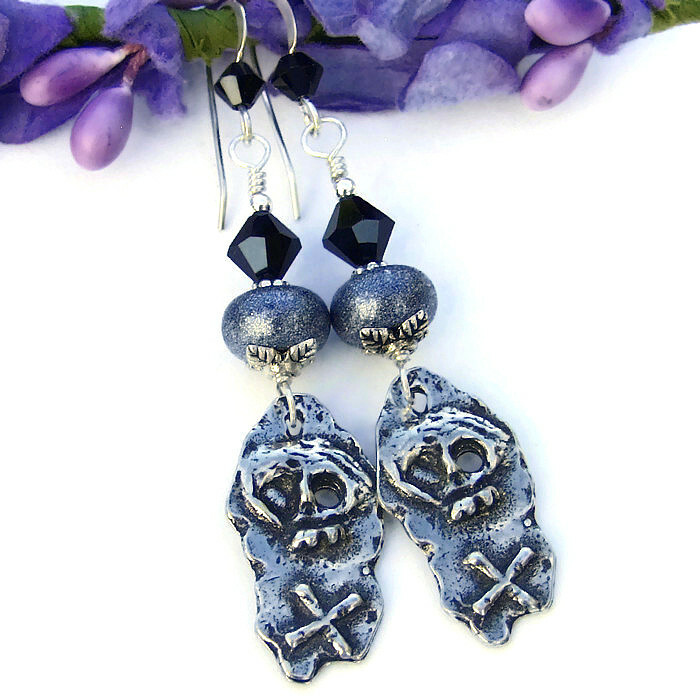 You don’t have to talk like a pirate when you wear these fun handmade skull earrings . . . but you will probably want to! 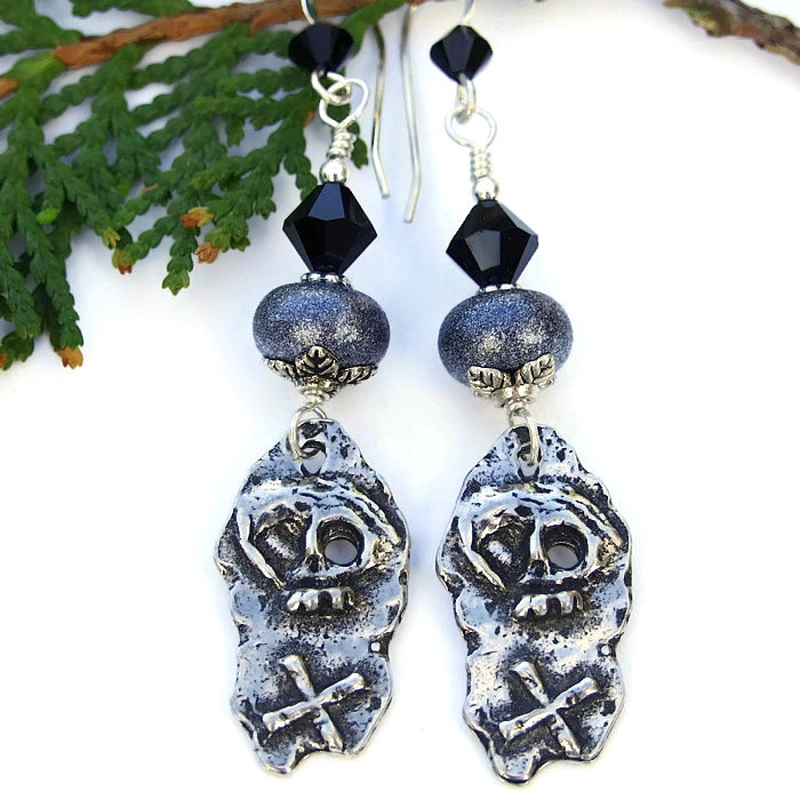 The X MARKS THE SPOT earrings feature rustic, artisan hand cast skull and crossbone dangles with exquisite raised texture. Pearlized gray lampwork glass beads, cupped underneath with a leafy bead cap, and black Swarovski crystals add lovely glow and sparkle. 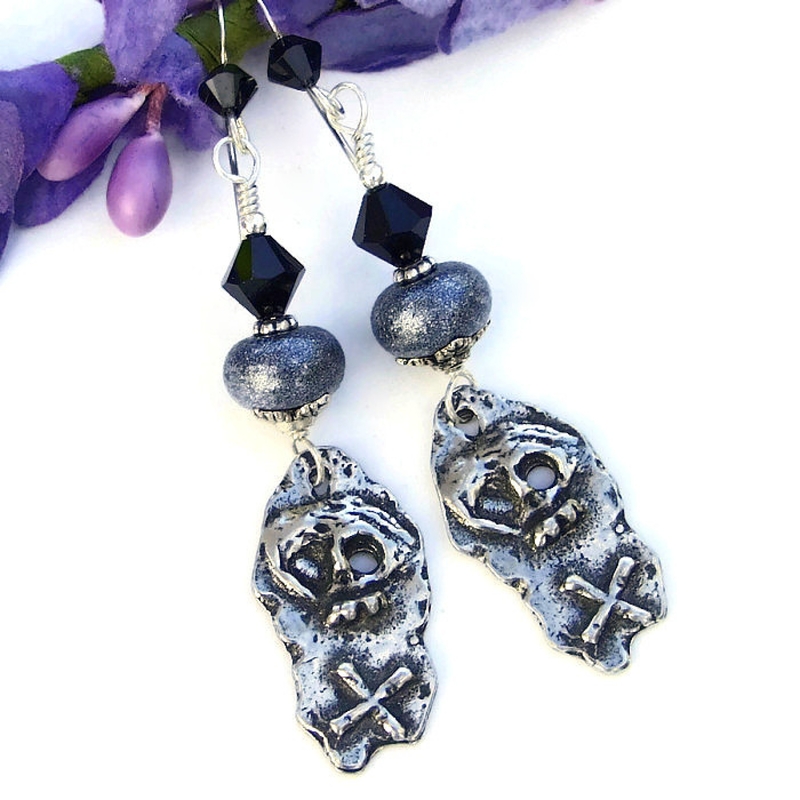 Perfect earrings to wear to a pirate festival, Halloween, Day of the Dead festivities or for every day wear, the unique X MARKS THE SPOT skull earrings were created for the woman who loves one of a kind jewelry. 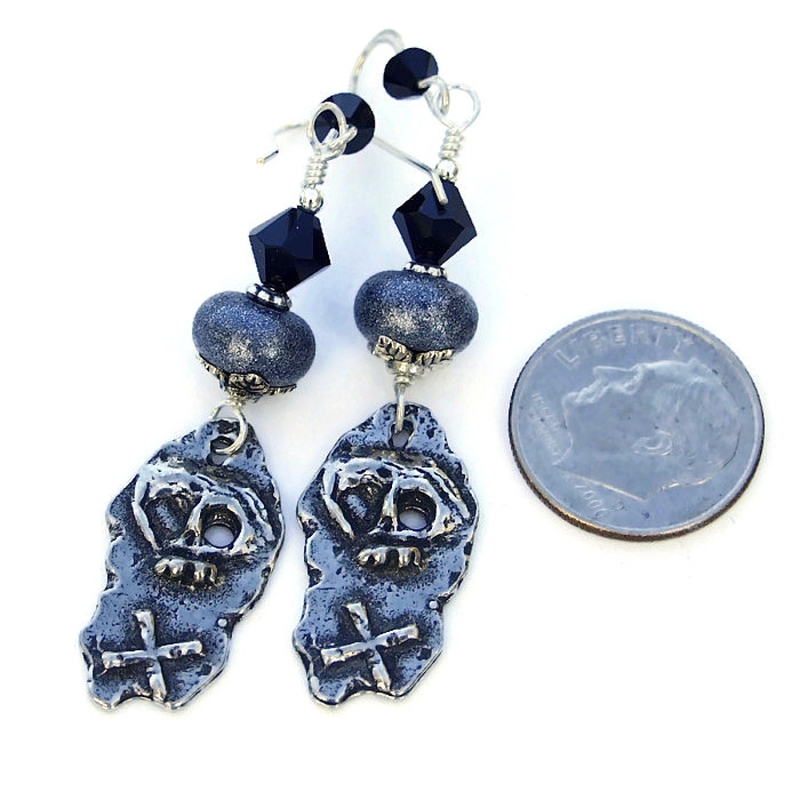 *** For a better understanding of the relative size of the X MARKS THE SPOT handmade skull earrings, please be sure to check out photo # 6 for a size comparison with a dime. 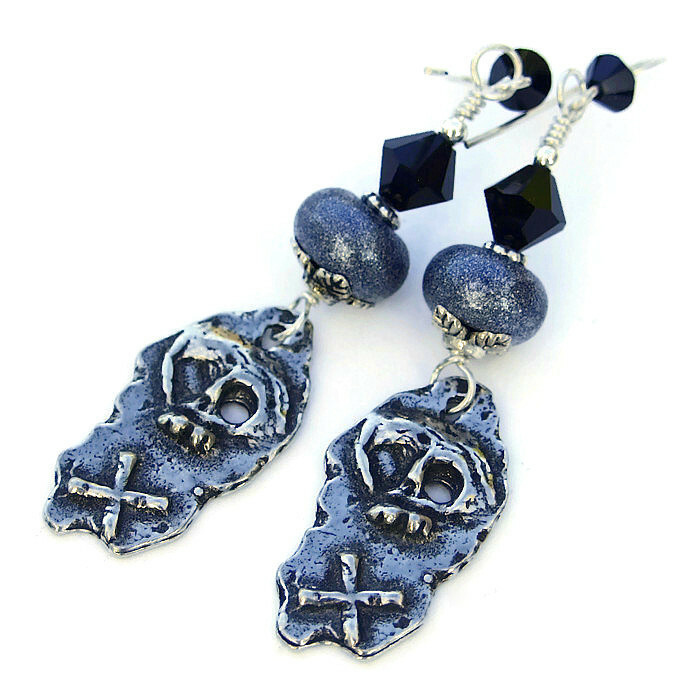 The fun and funky skull and crossbone dangles were artisan handmade by Vincent of Inviciti from lead free pewter. A skull and crossbone design is raised against the background, creating wonderful 3-D texture. And to make the dangles even more eye catching when worn, the right eye of each skull is punched through. The pewter has a shiny, bright finish with subtle patina to bring out the details. 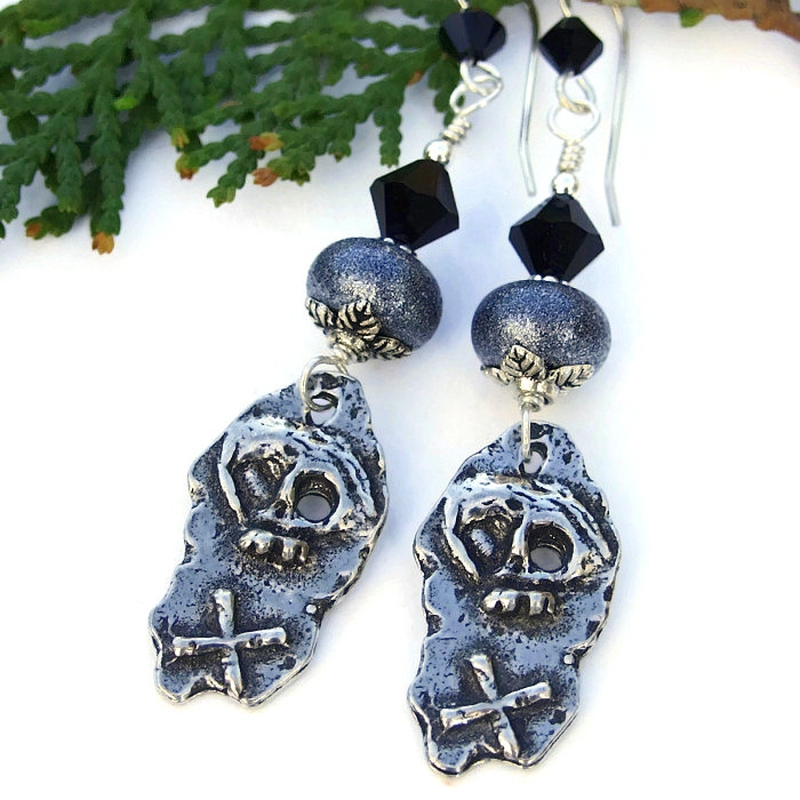 The skull dangles were wire wrapped on sterling silver wire to attach to the upper portion of the earrings. Stacked above the skull and crossbone drops are gray lampwork beads and Swarovski crystals. The glowing lampwork beads were individually created by Lisa Anderson-O’Neal from gray glass. The lampwork beads were then given a pearlized finish for extra glimmer and texture. A lead free pewter bead cap with a leaf design cups the bottom of the lampwork bead. On top of the lampwork bead is a 6 mm faceted Swarovski crystal, separated by a sterling silver daisy spacer. The color of the crystal is “jet,” a rich, true black. A single sterling silver bead can be found on top of each crystal. The X MARKS THE SPOT earrings are finished with sterling silver French hook earwires. A 4 mm jet black Swarovski crystal was added to each earwire for extra sparkle and fun. Skulls are believed to ward off evil and ensure protection and well being. Pewter is believed to be very grounding, bringing the wearer back to reality. Although man made, glass and crystals are said to carry the energies of transformation, rebirth and communication. Silver is a metal of love and healing; it is a mirror to the soul, helping us to see ourselves as others see us. 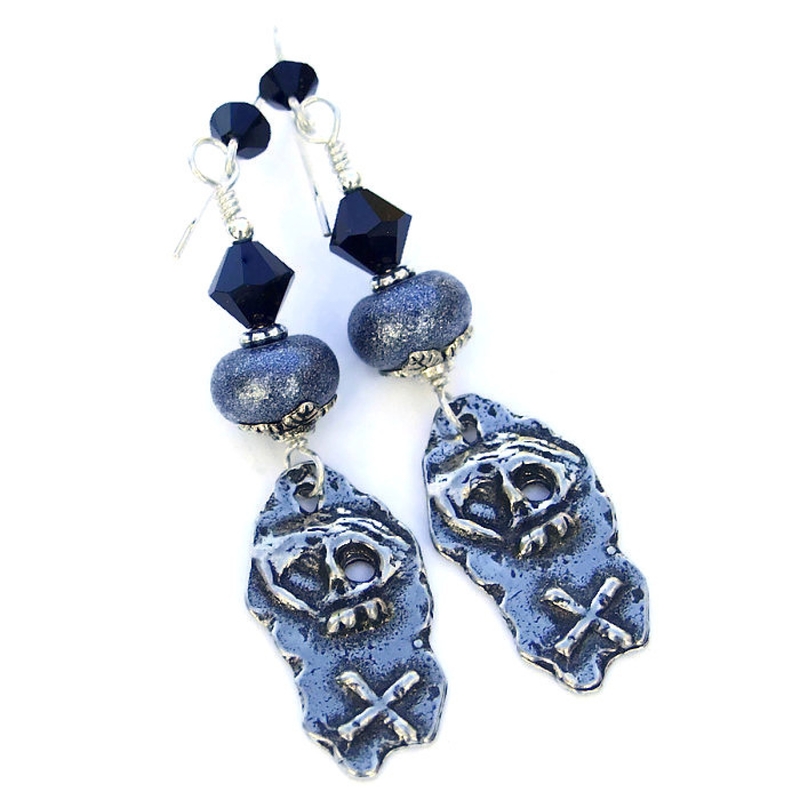 The X MARKS THE SPOT artisan earrings were carefully designed and handmade in a dog friendly, smoke free studio. They will be carefully packed in an organza jewelry bag with tissue, perfect for gift giving to a loved one . . . or to yourself!